There was an article in last Friday's Tallahassee Democrat regarding the hiring of lobbyists to help prepare the way for a new high school on the South side of town. They propose a doing a land-swap with the St. Joe Company in order to build the school somewhere along Tram Road. I believe this is a big mistake that will set Tallahassee back economically. One could argue that it would be a boon to growth in the South, and that would be correct. Unfortunately, it would come at a cost that is far higher to Tallahassee than the gains that would be made by a land developer. When a new high school is built in Tallahassee, there is a lot of evidence that shows it should be built on the West side of town. The West side already has a glut of homes and inexpensive land available which can handle the growth that will follow towards the new schools. More importantly, the West side has experienced a massive production of multi-family residences over the past few years that is only starting to impact the single family and townhouse market. The orange line in the graph below shows that 45% of the housing permits issued over the past 8 years have been multi=family, more than double the rate we saw in the previous two decades. This is a cycle change in the construction industry that has yet to truly impact our market. The large "for student" complexes that have been built on West Tennessee Street will be attracting tenants that have been occupying homes and townhomes on the West side of town. When those tenants move to the new facilities (and they will move to the new facilities), west side investors will find themselves in trouble. When investors can no longer lease their properties, they move them to the "for sale" market. 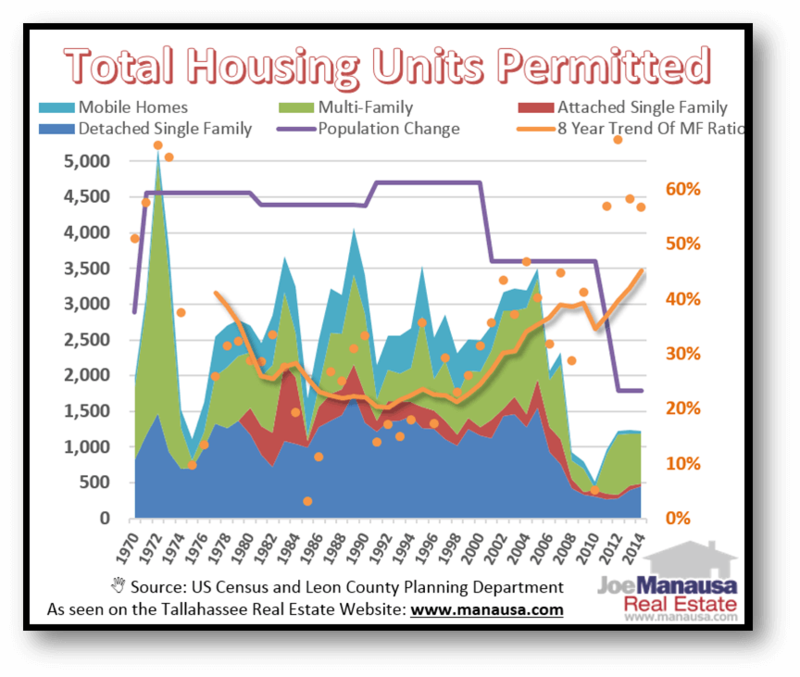 The West side of Tallahassee should prepare for several thousand additional homes and townhomes to be listed for sale in the coming years solely due to the new multi-family units that are coming on line now. The most natural place to put the next high school would be on the West side, as the homes already exist for the next stage of Tallahassee's growth. St. Joe wants to develop its South Side development and is pulling hard to bring the school there, but they will not be able to build homes at the lower prices that are already available on the West side. The cost of new construction is far higher than the prices that can be found in the existing homes market. Do we really need to build another high school to cater to people who live in $400,000 homes? Why not build the high school for a larger segment of Tallahassee's population? I know that Tallahassee's growth will continually require additional schools be built and the process of choosing a location will be heavily impacted (if not purely decided upon) by political pressures from the larger land owners in Leon County. I also know that I am not an expert on all the other issues that go into deciding upon the "best" location for the school, but it the decision were based upon helping restore the Tallahassee housing market for the broadest range of Tallahasseans, I cannot think of a better place to build the new high school than on the West side of town. This is the same philosophy that went into the location of I-10 many years ago where it has served as no effective use in moving traffic or economic development for Tallahassee. The south side has the infrastructure, land, growth potential, and capacity to accelerate the growth of Tallahassee. I hope that those is us who know the history will not let us make this mistake again. Thanks for commenting Henry. I wish you would elaborate. Do you think building a high school (anywhere) in Tallahassee will be a cause of economic development? And what about affordable housing for the families that will go the high school? Thanks. Your comments make perfect sense but I fear that the (lack of) planning by the City and the County will not hear this from your blog. Why not condense the argument and send it as an editorial to The Democrat? More folks are likely to hear it from there. Hey Virginia, I followed your advice. We'll see how it goes. Thanks again. Thank you for submitting a letter to the editor. We may contact you as a follow-up before publishing your letter, using the email address or phone number you provided. Again, thank you for taking the time to share your thoughts with Tallahassee.com.